March 2, Menshikov arrives in Constantinople with demands on the Porte. May 21, Menshikov leaves Constantinople, breaking off relations. May 31, Russian ultimatum to Turkey. June 8, British fleet approaches the Dardanelles. July 2, Russian army crosses the Pruth River into Moldavia (Romania). October 5, Turkey declares war on Russia. October 28, Turkish army crosses the Danube River at Kalafat (Border with Romania & Bulgaria). October 30, British fleet enters the Bosphorus. November 4, Russians defeated by Turks at Oltenitza (Border with Romania & Bulgaria). November 30, Turkish naval squadron destroyed at Sinope (Asia Minor). January 4, Allied fleets enter the Black Sea. January 6, Turks win battle of Citate (Romania). January 8, Russians invade the Dobruja (Romania). February 10, British peace deputation sees the Tzar. February 23, The first British troops sail for Turkey. March 11, The British Baltic Fleet sails from Spithead. March 19, French troops sail for Turkey. March 20, French Baltic Fleet sails. March 28, France and Great Britain declare war on Russia. April 5, British troops arrive at Gallipoli. April 14, Russians besiege Silistra (Bulgaria). April 18, Turkish victory at Rohova (Border with Romania & Bulgaria). April 20, Austria and Prussia declare their neutrality. April 22, The bombardment of Odessa. May 28, Embarkation of French and British force for Varna (Bulgaria). June 23, Russians abandon the siege of Silistra. June 26, French and British fleets arrive off of Kronstadt, near St. Petersburg. July 7, Russians defeated by the Turks at Giurgevo (Border with Romania & Bulgaria). July 28, Russians withdraw across the Pruth River (Romania). July 28, In Asia Minor, the Turks defeat the Russians at Bayezid (Armenia). August 13, Allies besiege Bomarsund in the Baltic. August 16, Surrender of Bomarsund. August 21, Bombardment of Kola, in the White Sea, by the British squadron. August 30, British naval failure at Petropaulovsk. September 5, Allies embark at Varna for the Crimea. September 14, Allies land unopposed at Kalamata Bay, north of Sevastopol. September 19, Allies encounter Russians at the River Bulganek. September 20, the Battle of the River Alma. September 23, Russians scuttle fleet in Sevastopol to block entrance to harbour. September 24, Flank march by Allies around Sevastopol. 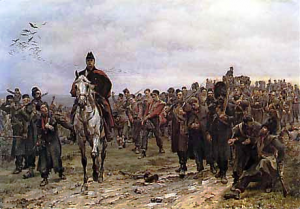 September 26, British enter Balaklava. September 29, French commander, St. Arnaud, dies. October 17, First bombardment of Sevastopol. October 23, Departure from England of Florence Nightingale and 38 nurses. 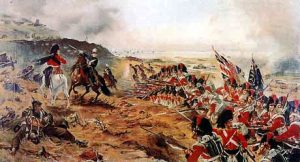 October 25, Battle of Balaklava, Charge of the Heavy Brigade, Charge of the Light Brigade, the stand of the ‘Thin Red Line’. 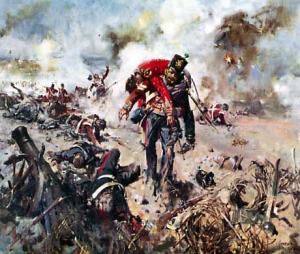 October 26, Russians attack of ‘Little Inkerman’. November 4, Florence Nightingale arrives in Scutari with 38 nurses. November 5, The Battle of Inkerman. November 14, The hurricane in the Crimea. December 22, Lyons replaces Dundas as commander of the British Fleet in the Crimea. December 24, Brout succeeds Hamelin as commander of the French Fleet in the Crimea. January 10, Russians feint attack on Balaklava. January 17, Russian attack on Eupatoria, north of Kalamata Bay. January 26, The Kingdom of Piedmont joins the Allies. January 31, Lord Aberdeen’s government falls. February 5, Lord Palmerston forms the new government. February 20, Allied attack across the River Chernaya frustrated by snowstorm. February 22, Russians seize and fortify the Mamelon, a position outside of the fortress and in front of the French lines. February 24, French attack on Sevastopol fails. March 2, Tzar Nicholas I, dies and is succeeded by Alexander II. Menshikov recalled. March 15, Conference of Vienna opens. April 4, Second Baltic expedition leaves Spithead. April 9, Second bombardment of Sevastopol. April 26, Vienna conference closes, without results. May 1, Fierce fighting on the French left flank at the Quarantine cemetery. May 2, First French expedition sails for Kertch, and is recalled by Canrobert. May 16, Canrobert, French Commander, resigns command, and is replaced by Pelissier. May 23, Expedition to Kertch sails again. May 25, Kertch and Yenikale captured. May 26, Allied naval forces enter the Sea of Azov. June 5, ‘Massacre’ of Finnish crew by Russians at Hang (Finland). June 6, Third bombardment of Sevastopol. Capture of the Mamelon and the Quarries by the Allies. June 16, First Russian attack at Kars (Armenia). June 17, Fourth bombardment of Sevastopol. June 18, Main assault on the Malakov and Redan defeated, with heavy losses. June 28, Death of Lord Raglan. July 1, General Sir James Simpson appointed to command of the British army in the Crimea. July 14, Conference at which Turkish commander Omar Pasha asks permission to withdraw his troops and concentrate on Asia Minor. August 7, Second Russian attack at Kars. August 9, Bombardment of Sveaborg (Finland). August 16, Russian attack at Battle of the Chernaya River and defeated by French and Kingdom of Piedmont forces (Northeast of Balaklava). August 17, Fifth bombardment of Sevastopol. September 5, Sixth bombardment of Sevastopol. September 6, Omar Pasha leaves for Asia Minor. September 8, At Sevastopol, the attack on the Malakov by the French is successful. The French fail at Little Redan, and Bastion du Mƒt. The British fail at the Redan. September 9, The Russians evacuate the South Side of Sevastopol. September 29, Russians attack at Kars defeated. Cavalry skirmishes at Eupatoria. Omar Pasha’s troops embark for Asia Minor. October 3, Omar Pasha’s army lands at Suchum Kaleh, south of the Caucasus Mountains, with an expedition for relief of Kars. October 7, Kinburn expedition sails for the mouth of the Dnieper River. October 17, Allied expedition captures forts at Kinburn. Ochakov evacuated by Russians. October 22, Selim Pasha’s army lands at Trebizond, and marches to Erzerum (Armenia). November 6, Omar Pasha defeats the Russians at the River Ingur, south of the Caucasus Mountains. November 11, Sir James Simpson resigns as British Commander, and is replaced by Sir William Codrington. November 15, French magazine at Sevastopol explodes. November 26, Russians accept surrender of the Turkish forces at Kars. December 8, Omar Pasha’s army forced to withdraw from the River Skeniscal, south of the Caucasus Mountains. December 16, Count Esterhazy takes Austria’s ultimatum to St. Petersburg. January 16, Tzar Alexander II accepts the Austrian demands. January 29, Russian guns bombard Sevastopol. February 25, The Paris Peace Conference opens. February 29, The Armistice is signed. 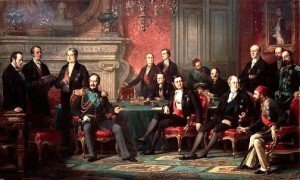 March 30, The Treaty of Paris is signed. April 27, Ratification of the Treaty of Paris in London formally ends Britain’s participation in the war. Appendix I, The Crimean War, R.L.V. ffrench Blake, Archon Books, Hamden, CT 1972.